Join the discussion on our forums! Come discuss Eater of Secrets over in our dedicated Eater of Secrets discussion topic. Battlecry: Destroy all enemy Secrets. Gain +1/+1 for each. now that rogue has secrets too, this card should became classic! "Why destroy when you can control?" says Kezan Mystic aka Illusive Man to Eater of Secrets aka Shepard. Recently I keep loosing games against this card. Are there so many mages on ladder at the moment that its worth playing this card? This guy right here! MVP vs mages! the sure joy when there safety net from lethal is gobbled up! Om Nom Nom Nom!! Great card in the current meta when there are secret mages and murloc paladins everywhere. One of that should be an autoinclude in any deck. Except Hunter, they already have Flare. Was wondering: if it eats secrets, what does it poop? Publicly known infos? Eater of Ice Blocks, basically. I wonder if this will see play if Quest Mage gets popular. Such an underrated card, i almost always pick it in Arena. It almost always pulls through. Started playing this in control mage. Is good against sceret hunter,pally, freeze mage(never beaten one without this guy) and is good as secrets contantly pop out of spellsinger for my oponent. 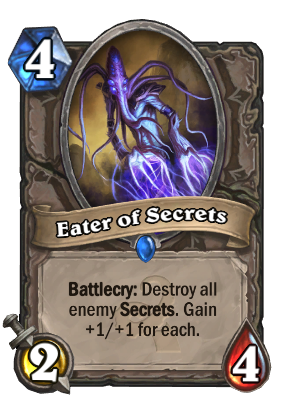 Thank you eater of secrets for eating those iceblocks.